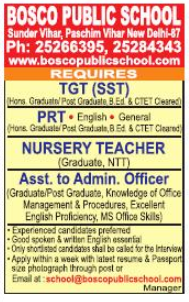 Bosco Public School, New Delhi has advertised in Hindustan Times Newspaper for the recruitment of PRT plus TGT job vacancies. Interested and eligible job aspirants are requested to apply with in a week. Check out further more details below. About School: The school is managed by Bosco Educational Welfare Society. It is functioning since 1985 under the supervision of highly competitive, dedicated and educated teachers. The school is affiliated to the central board of secondary education under the 10+2 scheme. Our institute offers a wide choice of activities – academic aesthetic and athletic – to provide an environment enriched with excitement, challenge and competitiveness. Physical Education &work experience are an integral part of the curriculum. To meet the demands of the management aims to prepare children for life imparting knowledge, skills, qualities and attitude & looks forward for true sincere cooperation from parents. How to Apply: Interested candidates may apply by sending resume with photo with in a week through post or by mail.